With all the different diet techniques available, it’s sometimes difficult to know what actually works. You may hear “low carb” or “Whole30” on the daily, but those diets restrict certain types of foods—and nobody likes to say no to foods they enjoy. Enter intermittent fasting (IF). This protocol, which is less of a diet and more an eating pattern, focuses on when you eat instead of what you eat. To do it, you simply have short and recurring cycles of not eating (called fasting) followed by windows of eating. IF is based on the notion that regular, short fasts help your body burn fat more efficiently. A handful of studies have shown it’s a great tool for weight loss. Interested in learning more? Read on to find out if IF is for you. What is the 16:8 method? There are a few ways to go about IF. The 16:8 method, designed by nutrition expert and personal trainer Martin Berkhan, is one of the most approachable. It requires fasting for 16 hours a day and then eating your meals within the remaining eight hours. A common 16:8 schedule is to fast from 8 p.m. until noon the next day. 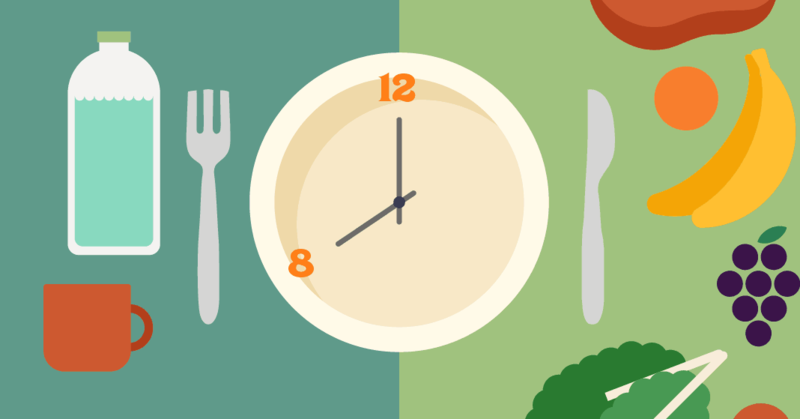 However, you can choose your time windows based on your schedule, even if that means you start eating at 6 p.m. and begin fasting at 2 a.m.
You might be wondering how this diet helps people burn fat, stay energized, and maintain or lose weight—especially if you don’t focus on the types of foods you eat or don’t count calories. By design, IF often cuts out a meal every day; for many people that can mean consuming fewer calories overall. A recent study found that two different groups—calorie cutters and intermittent fasters—lost the same amount of weight, suggesting calories consumed ended up being equal across both groups. But there’s more to regularly fasting than just calories. Whenever you eat, your body will spend a few hours processing and burning that meal, typically burning it as energy instead of fat. During your fast, your body won’t have any recent food to burn as energy, so it is more apt to find energy through stored fat, thus improving your metabolic health and helping shed extra pounds. Any new diet pattern takes time getting used to. Here are some tips to help you ease into it so you can give it your best shot and see some results! Don’t go overboard at the start trying to fit in your meals to your exact time windows. If you are too strict right away, an IF plan may be tougher to stick to. Plus, while most people who do the 16:8 method try to do it every day, you certainly don’t have to. Consider taking the weekends off so you can enjoy breakfast in bed or an evening out with friends. When you break your fast, it’s best to meal plan. If you’re particularly hungry, it’s easy to go overboard and overeat. However, if you already have a meal prepped or planned, you’ll be less inclined to dive headfirst into the snack drawer. While the beauty of IF is that there’s no calorie counting, it’s important to use fasting as a tool—not an excuse to eat junk. If you want to lead a healthy lifestyle, IF won’t mean you can pig out on candy bars, ice cream, and fried food every day as long as it’s during your eating window. Allow indulgences, but eat plenty of whole foods such as fruits, veggies, whole grains, and lean meats. Eat foods full of protein and fiber during your eight-hour feeding window to help feel fuller longer. Lean meats, legumes, nuts, veggies, and whole grains all fall into this category. Be careful when it comes to working out during your fast. Your body needs ample fuel to recover, so keep your workout regime light with yoga or neighborhood walks. Plan your workouts accordingly, too. If you know that your eating window beings at 11 a.m., workout right before so you can amply recover with a good meal. You don’t need to stick to your same time windows every time you fast. 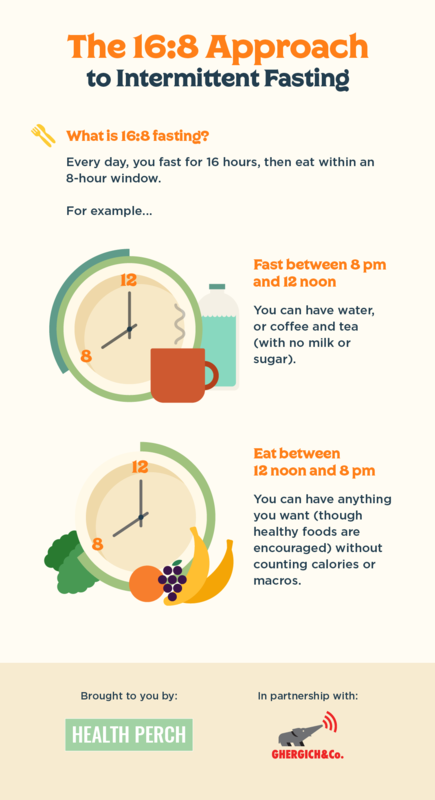 Try experimenting with different times for eating and fasting, and see what sticks! Being adaptable is key to make IF sustainable. No one way of eating works for everyone. A few studies say IF is not great for women. One trial found intermittent fasting worsened blood sugar control for women. If you’re trying to conceive, it’s best to not deprive your body of food through fasting. Bottom line: If you have any health concerns, you should always talk to your doctor before making a drastic shift to your diet. If you want to give intermittent fasting a try, follow these tips to better adapt. Remember to be patient, listen to your body, and stay positive to get the most out of this new approach to eating.